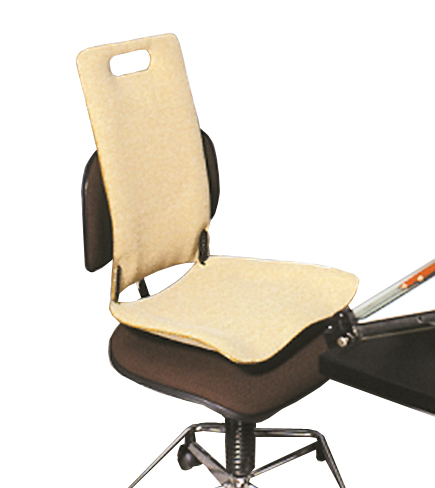 MEDesign Backfriend - The most versatile back support we have seen in 30 years. NOTE: Choose either "Single-Padded" or "Double-Padded"
Whether the chair you have to sit on is soft and sagging, as upright as a church pew, or even a bench against a wall, Backfriend will provide comfort and support. It can even be used for reading in bed. 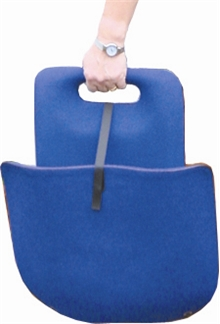 The Backfriend fits more people, and can be used in more applications, than any other support we have seen in decades. That said, there is no such thing as a one-size-fits-all solution for lumbar supports. Anatomical variations in human beings are vast and sitting supports can be difficult to fit, especially in cases where a combination of seat inserts may be required to address your seat height, contours, resilience, and angles. The following tips will help you decide whether the Backfriend is for you. We hope so! We recommend the single-padded model for most users. Double padding can mask the anatomical contour making the seat less effective for some. The Backfriend is a VERY FIRM back support. Even the double-padded model is VERY FIRM. This is a desirable feature for most individuals. However, if your spine has an unusual shape or there are bony protrusions on your back, you may prefer a back support with more cushioning. Maximum body weight 280 lbs. Genuine acccessories and replacement parts for the MEDesign Backfriend. Manufactured in the United Kingdom to the highest quality standards. 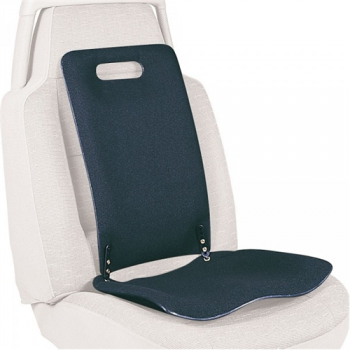 Enhance your Backfriend with luxurious comfort. The resilience and pressure dispersion of real wool are unmatched by any synthetic fiber. 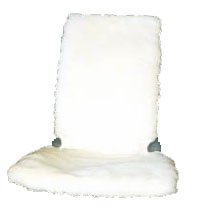 Naturally adjusts to fluctuating temperatures to keep you cool in summer and warm in winter. Machine washable. Replacement hinge set for the MEDesign Backfriend. Set includes 2 hinges and written instructions. Replacement hinge lock set for the MEDesign Backfriend. Set includes 2 hinge locka and written instructions. Replacement Velcro for the MEDesign Backfriend. Includes pre-cut hook and loop and written instructions. Defects in materials or manufacture which occur within 12 months from the date of purchase will be repaired or replaced at the option of MEDesign Ltd. Customer is responsible for delivery charges to UK. Please contact your Backfriend dealer for assistance with warranty service outside of the United Kingdom. Repairs required due to accidental damage, normal wear and tear, or misuse are chargeable.